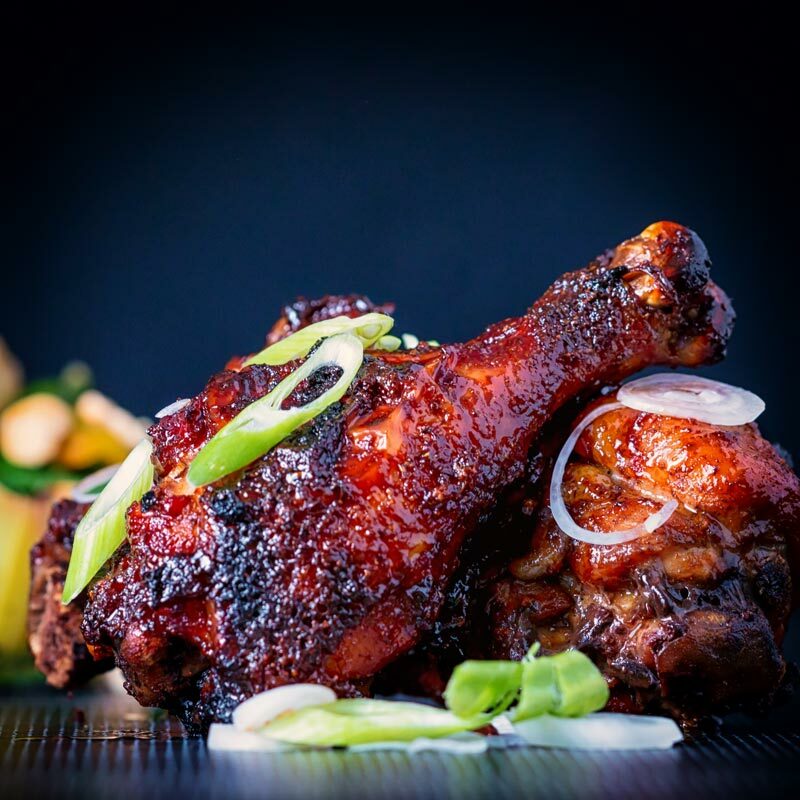 Finger Licking Sticky Chicken Drumsticks coated with a rich and dark glaze heavy with chili and a secret ingredient! Perfect for the oven but would work equally well on a BBQ! 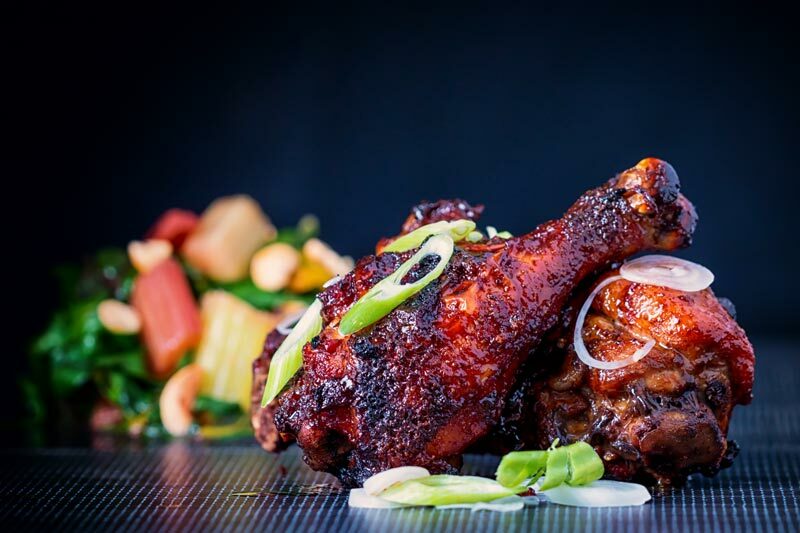 Finger Licking Sticky Chicken Drumsticks. My Sticky chicken drumsticks and not just any old baked chicken drumsticks. Finger licking ones too! 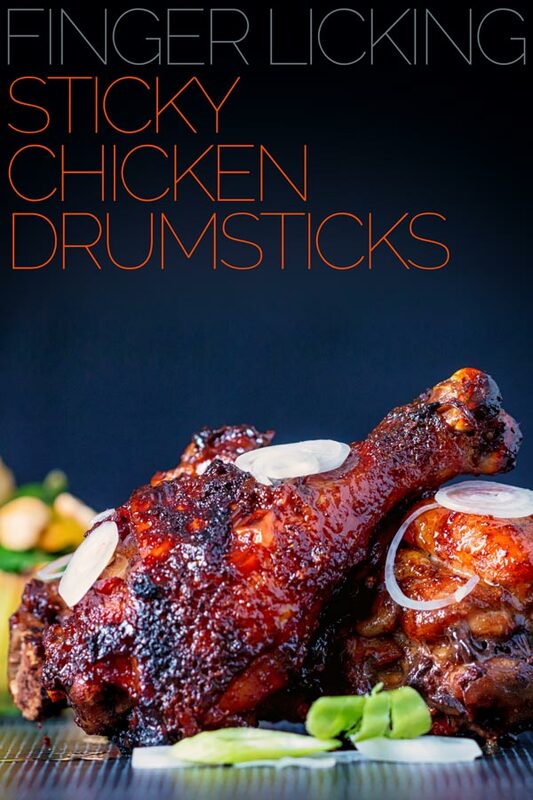 For me, there is just something about drumsticks! Sure the thigh has a little more flavour but mother nature never made the thigh with a perfect little handle. I have returned to a personal favourite for todays recipe as I have had a nightmare in the kitchen this week. 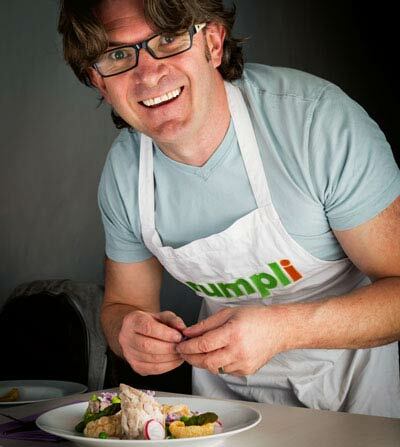 I have been working on developing a bread recipe for the last few days after the success of my first baking recipe on Krumpli. A Cherry Bakewell Tart no less. Unfortunately, my latest bread endeavours have proved to be nothing short of a disaster. However I will continue and you can rest assured by the time, or if ever the recipe is published it will be checked and checked again. But for the moment I am taking a walk from baking but will be back. This is food for comfort a sweet, salty, spicy & sticky glaze on some simply baked chicken drumsticks. I often find that simple food is the most comforting and whilst marinading and reducing the sauce takes a little time. It is all really easy cooking and the result is noise inducingly good. Most sticky glazes I rely on honey or brown sugar and whilst our local honey is good, nay great. I do love a bit of dark treacle or molasses in my sticky glazes, these sticky chicken drumsticks are no different. That slight bitter edge you get for me is heavenly. I also used a generous amount of our own sweet chili sauce. As for the cherry jam, well it just gives it the fruity mellow sweetness that I like in my glazes! You could use this glaze on pretty much any meat you can stick on a BBQ. It is particularly good with pork and have used it on these oven roasted bbq ribs with great results. 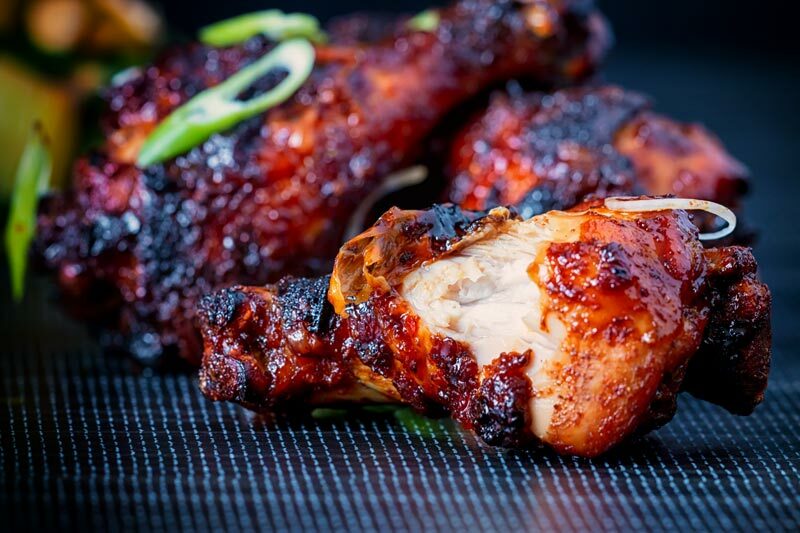 How To Cook Sticky Chicken Drumsticks On The BBQ. As I mentioned that this chicken drummers recipe works well on the grill I suppose I should tell you how to cook em. The process is simple, you want to carry out the dry rub process as per my recipe. After that make up the sticky glaze, you can do this on the grill if you wish. Then I like to add ‘paint’ the chicken drummers with some of the glaze and sear over some hot coals. Then I transfer to the indirect heat section of the grill and close the lid and bake for 20-30 minutes. Glazing with more of the sticky stuff every 10 minutes or so. I like to finish off over the direct heat with the last of the glaze before serving. Finger Licking Sticky Chicken Drumsticks coated with a rich and dark glaze heavy with chili, perfect from the oven but would work equally well on a BBQ! These sound and look wonderful but am not sure I know what 200c converts to in Fahrenheit? Hey Patti, 200°C is 400°F, you will be pleased to know I am going through my site and adding Fahrenheit temperatures in addition to Celcius. Wow, I love the sound of using cherry jam, the glaze sounds fantastic! Your photos are making me drool! Hi Brian these drumsticks look so yummy! Do you think I could make them ahead, say in a Friday night and store them then preheat them the following day and serve? Thanks for sharing this recipe! I made these today with a little twist! They were stunning but sweet as hell haha 🙂 I link back to your site as soon as I’ve published the recipe! Cheers and thank you very much for inspiring me! Thank Petra, I hope you enjoy it! Wow! I am drooling at the pic. Cherry jam in the glaze sounds super innovative. Must ,should,will try asap? Thank you, hope you enjoy… The jam is very subtle but helps with the glaze and gives a richness to the flavour. Sweet and Spicy God in heaven! These look like I died and went to heaven! Thanks for sharing this at #SaucySaturdays! OMG you mixed the paprikas! You mad man! And I also have homework cuz I ‘ve no idea what black treacle is. But it’s worth it because I can do this in oven and that makes me so happy. Thanks for linking at #SaucySaturdays, Brian. Also, I’m glad you didn’t “neaten them up.” Love them just like this in all their sticky glory. These look incredible Brian! 🙂 I absolutely love how beautifully sticky and flavourful they look! Some foods just need a big pile of napkins! 😀 Thank you for sharing this with us at #SaucySaturdays! Brian this sounds scrumptious, I’ve never used sweet and hot paprika at the same time, I assume they’re complimentary? With the dead batteries, the shots are beautiful..Looks like a perfect fit for the summer evening.. Loving the presentation..
Black treacle is a dark, thick, sugar syrup… For a substitute you could use Molasses, there is a technical difference in terms of how they are produced, however the flavours are very similar. These really do look fantastic Brian. Do you leave the skin on or take it off before running etc? Ground up chicken skin breadcrumbs might be the best idea I’ve ever heard of!